We are addicted to the Smithsonian Zoo’s Panda Cam. Not much happens. In fact, nothing happens. Panda’s are among the most inactive animals on the planet, like Koalas, both sleep for long periods during the day and at night. 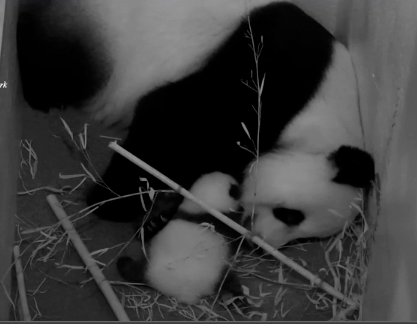 But watching Mei Xiang snuggle with her cub is great therapy for us. We are both crazy about animals. I’m sure you saw this but I have been walking around making this noise for two days – and of course amusing only myself. Wow! That’s so human sounding..
My dog Ursie was fascinated by this baby panda’s “ow” sounds.